I also liked the Chicken Pirzola. This is chargrilled chicken, with the right bite of Jack’s Joint secret herbs and spices. I also appreciated the veggies served with it. My favorite dish in Jack’s Joint was the Ox Brain, which melted in my mouth. The flavor of this dish made me consume a large amount of rice and salad. I also liked the pita bread with humus. Given the bland taste, the humus I think will be a suitable “merienda” dip for me – I guess I will have to try it with lettuce for a more healthy twist. The Lamb Chops is also a great dish. Jack’s Joint lamb dishes are Halal certified. For diners who have kids in tow, you can order their Quarter Pounder with Cheese. The crunchy fries and soft to the bite burger will never fail to disappoint your hungry kids and teens. Other non-Turkish or Mediterranean dishes are the 4-Cheese Pizza. There is a very good reason for me to come back to Jack’s Joint, this time with the entire family. 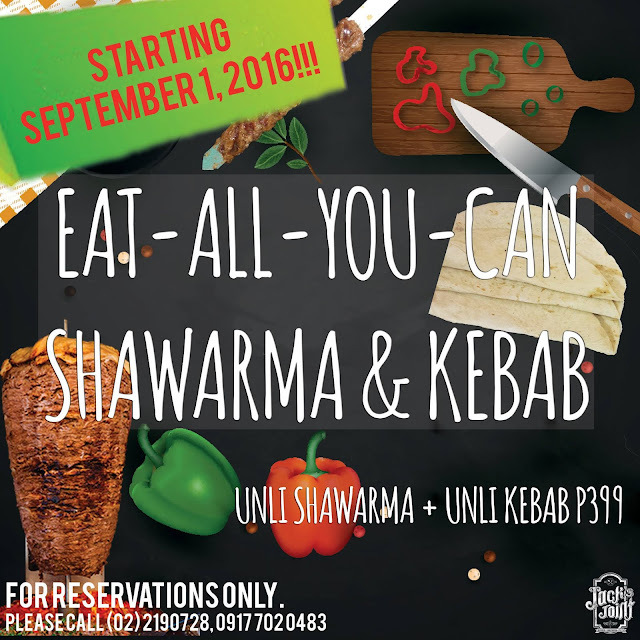 We would like to try their UNLI KEBAB and SHAWARMA. Because the hubby is such a huge fan of Kebabs, I guess he will enjoy it the most. JACK’S JOINT: located along Panay Avenue (parallel to Quezon Avenue), between Scout Albano and Scout Borromeo. Landmarks are M Place Condominium and Ministop.